None of the three look good, but Anchal stands out. This would have been nice if Angelea had closed her mouth. Angelea & Genesis are doing a terrible job, but Anchal does not look bad. Never thought they would work together. Anyway, Anchal looks quite fabulous and steals the shot, while Angelea looks rather manish here. who the eff is genesis? 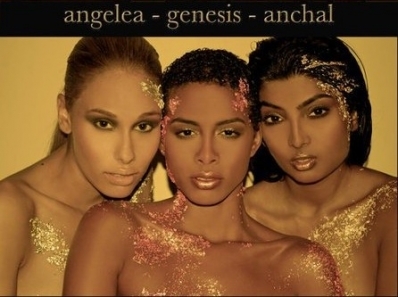 angelea isn't doing much but at least she's with a soft face and anchal looks exquisite.